Source: CICH graphic created using data adapted from the Canadian Institute for Health Information. Children Vulnerable in Areas of Early Development: A Determinant of Child Health. Ottawa, ON: CIHI; 2014. 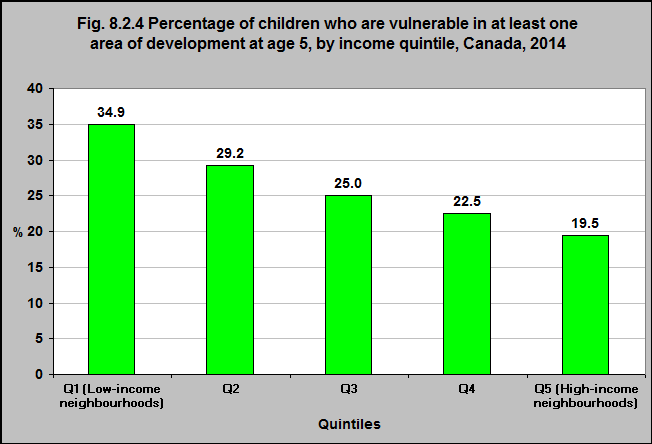 Children living in the lowest income neighbourhoods were more likely to be vulnerable in at least one domain of the Early Development Instrument (EDI)* than were children in the highest income neighbourhoods, 34.9% and 19.5% respectively.